Ovett’s last match on an IWRG show is 1998 – at least under that name. Today’s the day. 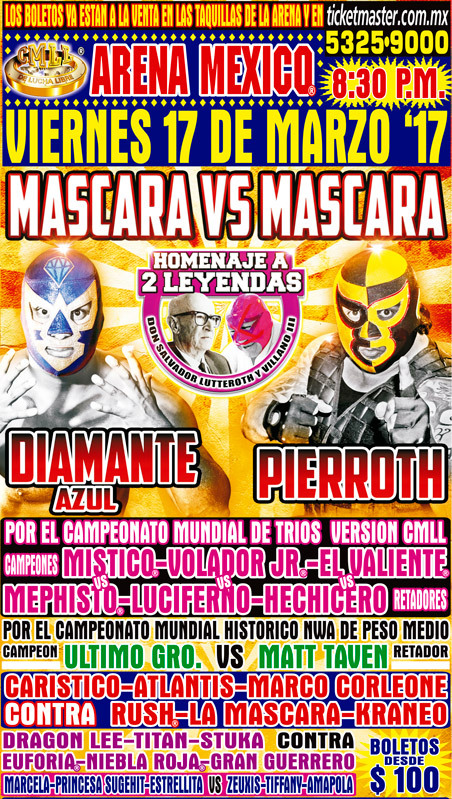 Pierroth & Diamante Azul will finally have their mask match. It’s not exactly a anticipated mask match. Dreaded seems more accurate. I wrote (way too much) about this match and the rest of the show in a preview going up soon on Voices of Wrestling, and my theory is the best chance of this match being good is being the style of match CMLL hates, an out of control brawl where the rules are generally thrown out the window. CMLL teased this possibility last week with the potato chip result and the brawling in the crowd. On Informa, Maximo, Terrible and Marco Corleone said they’d back up Diamante Azul on this show because they’re sick of Los Ingobernables. It’s an Informa angle so nothing may come of it, but lots of people interfering and counter interfering is what this match needs. If CMLL leaves Pierroth and Diamante Azul by themselves, they’ll fail, and CMLL will have failed them. The big news going into the show tonight is the change in the semimain. Ephesto is out. He missed Tuesday’s show in Guadalajara because he underwent surgery on Wednesday after suffering blood poisoning. I wonder if it’s something like his appendix bursting, which would cause that issue. CMLL’s said he’ll be out a month, and Hechicero will replace him tonight. I think that actually helps the match a lot. The chances of the Sky Team losing the trios titles is about extremely low with a makeshift team, but it was never all that high to begin with. Ultimo Guerrero is hoping the people cheer for him against the foreigner tonight. He’ll probably get his wish. Matt Taven has arrived for that title match. (Okumura was there to meet him, a surprise.) CMLL hasn’t said how long he’s sticking around, but it can’t be more than two weeks since Taven’s booked on the ROH WrestleMania show. That doesn’t seem quite long enough to do a title win and lose it back the next week, but CMLL could still just figure out how to get the title back later. It’s not a great chance for a title change, but more likely than in the other title match. Today’s show will honor Villano III, and his mask match with Atlantis 17 years ago. In a media session a couple weeks ago, Villano III says he does not believe Atlantis was better than him, but just more prepared on that specific day. The show starts at 8:30pm local, which is an hour later if you changed your clocks this weekend. It’s not airing officially live, though I suspect there will be video feeds in the wild and will be posting about them on Twitter as a find them. CMLL has said they’ll have the show up after it airs, which could mean anything with CMLL. 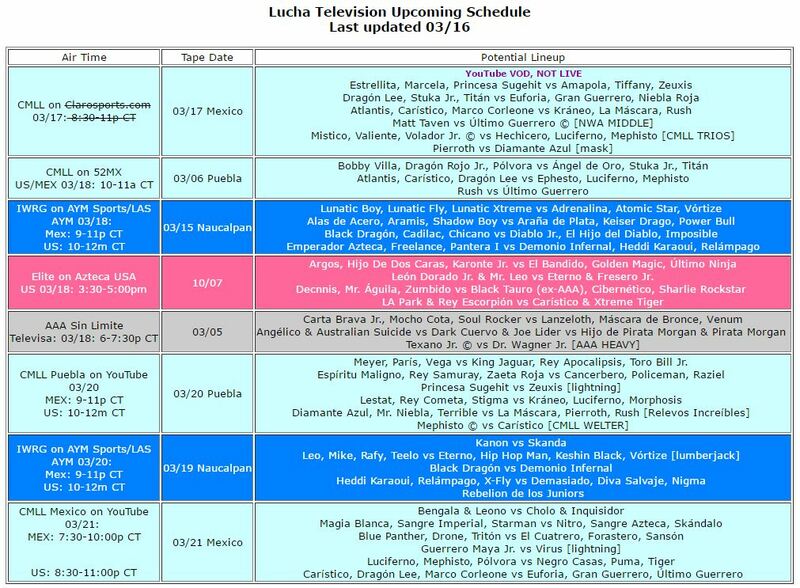 For the anniversary show, CMLL put it up around 2AM local time. It then got locked down by YouTube because they were using copyrighted music on paid content. I wouldn’t recommend waiting up until the early hours to see if they’ve got this one figured out. Lucha Underground starts on Tele 5 in Germany on May 1st. It replaces RAW on the station. AAA & Perros del Mal are holding a memorial mass for Perro Aguayo Jr. on Tuesday morning. It’ll be the second anniversary of his death. Hechicero also replaces Diamante Azul in Monterrey on 04/02, facing LA Park, Rush and Lashley in the main event of the MDA show. Lector 24 writes about Duck Black Jr. losing a title match to Green Demon, from the standpoint of all the regulations which were broken during the match which should’ve meant Duck Black Jr. should’ve been still champion. (Assuming they’re not just making up the regulations.) It was a three fall match that went to a draw and was restarted for a fourth fall, so they’ve got a point. Cara Lucha is teasing another Bestiario, their talent search contest. Wasson won the first one, with the idea he’d be a regular Cara Lucha participant. He hasn’t been, but Cara Lucha explains it because he’s injured. Sorpresa Es Lucha talks about some recent lucha libre matches they’ve seen. Soul Rocker & Dave the Clown were part of a cancer awareness event. +LuchaTV has a new edition of Usted Queria La Lucha w/Atlantis and Atlantis Jr. as guests. The Crash has come to Mexico City. It’s going to be a card Mexican fans will like for the avalanche of star names, it should do well with crowd size, and the ticket prices are high enough that they may not lose their house on it. That’s good. “Having a better show than AAA in AAA’s building” is also a thing, and they’re probably do OK there. They messed with AAA by booking Astrolux in an opener, so that’s a win already. At the same time, this card does seem like so much overkill, 40 people on a card where about 20 would’ve meant the same thing, and everyone’s value reduced by being lumped together in matches with a lot of people when most of them are much better as singles. The people who like to see Bobby Lashley did not become a fan of him because of his work in trios matches. Same for Jeff Cobb or ACH or Matt Sydal. The Crash model is PWG and super indies of that mold, but that only seems to extend to talent selection – the matches themselves are still the same lucha libre filler six man format with people less experienced in doing them. PWG doesn’t bring in Pentagon to have whatever matches, they bring him in to have specific dream matches. Cody Rhodes, Matt Sydal and the NOAH champion is a trio no one thought they’d ever see, but that’s only because it’a a collection of three random outside of the WWE people, not because there’s any reason to see them together. And yet they kind of have to be a team, because there’s so many people on this show. I like trios matches in CMLL. CMLL is the most antiquated promotion in the world. The Crash is trying to be cool and new and should be the least CMLL thing possible. Stop doing so many trios matches. The other thing that frustrated me, as far as making the same mistakes other people do, is why have a title called “cruiserweight championship” when there are at least 13 different cruiserweights on the show who are in matches higher up than the cruiserweight #1 contenders match. I know “the midcard title of guys who like but don’t think are top stars” is long for a name, but that’s how it’s being used. Either make titles things that can be in the main event or semimain, or don’t bother to have them at all. I think this show will be a short term success and people should absolutely go – I’m disappointed that there’s apparently zero movement on officially taping and selling these things and I’ll be scouring for handhelds as usual, because I’d like to pay to see it myself. I’m just concerned about the problems The Crash lasting for the long haul. Good luck trying to figure out how to top this for the second show when you’ve already given so much the first time out. No one knows exactly when the CMLL VOD will be released or what it will cost. It probably won’t be much, it probably will be just after the show ends – but it’s lucha libre and digital media, and CMLL could just put up Wednesday without blinking an eye. I would recommend not staying up until the wee hours to see if they put it up. AAA leads into Rey de Reyes with a match with none of the people on the show, a six man match with one person on Rey de Reyes and a stipulation that seems to conflict with a match on that show, and a mystery angle in the main event which may be completely ignored the day later and has nothing do with the match any of them are having on a show. I don’t know. I also don’t really have a good feel for Elite, who seems to be stretch out the TV as long as possible to no real end.